BUFFALO, N.Y. (April 2019) — Mokon, an international leader in high-quality circulating liquid temperature control systems, is pleased to announce a line of high-performing equipment designed for critical environments. Applications include biotechnology and pharmaceutical, extrusion, food and beverage processing, laboratory, medicine and vitamin processing, mixers and blenders, packaging, pet food processing, personal care/cosmetics, reactors, sterilizers and fermenters, surgical equipment and devices, and vessels/jacketed tanks. Mokon's new line of sanitary designs including circulating water, portable chillers, and combination chilling and heating systems are designed and built for cleanroom and sanitary environments. The equipment will meet ISO Standards for Cleanroom and associated controlled environments with stainless steel materials. Equipment will feature NEMA 4X rated panels and wash down designs, and stainless steel cabinets. Temperatures range from -20°F (-29°C) up to 380°F (193°C). For over 60 years, Mokon has set the standard for high-quality circulating liquid temperature control systems. Through the development of new products, refinement of existing designs, and our ability to create custom engineered solutions, Mokon has consistently demonstrated its ability to foresee the evolving needs of customers in plastics, packaging, converting, composites, food processing, pharmaceutical, chemical processing, rubber, printing, general processing, and many more industries. The company's product line has grown significantly since it first introduced a water temperature control system in 1955 to include heat transfer oil systems, portable and central chillers, pump tanks, cooling towers, blown film coolers, cold climate coolers, engineered and pre-engineered control panels, maintenance products and custom designed/engineered systems. 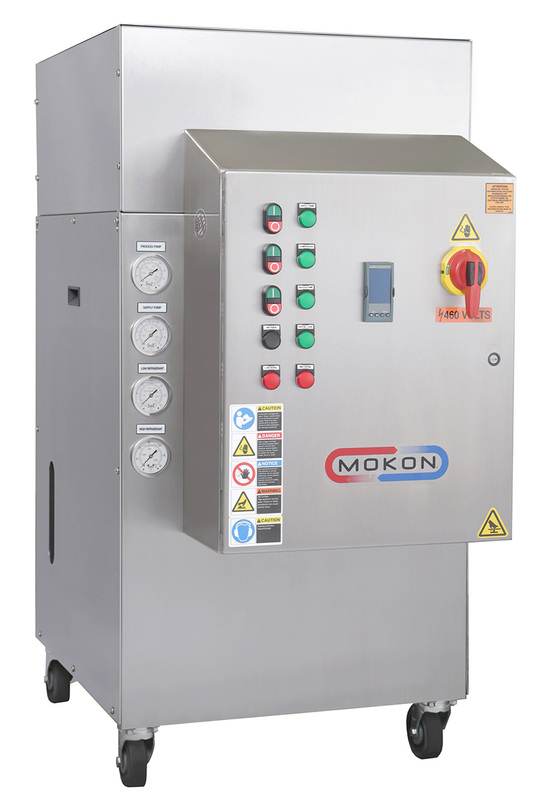 Mokon's circulating liquid heating and chilling equipment is proudly designed and manufactured in the USA. Mokon is an ISO 9001 and ISO 14001 certified company.